I do however find it kind of ironic that amazing pie ingredients are available at the hottest time of the year, when pie dough is a picky beast that refuses to co-operate unless chilled. I am definitely not missing the constant rotation between bench and fridge in an effort to keep everything cold and co-operative! 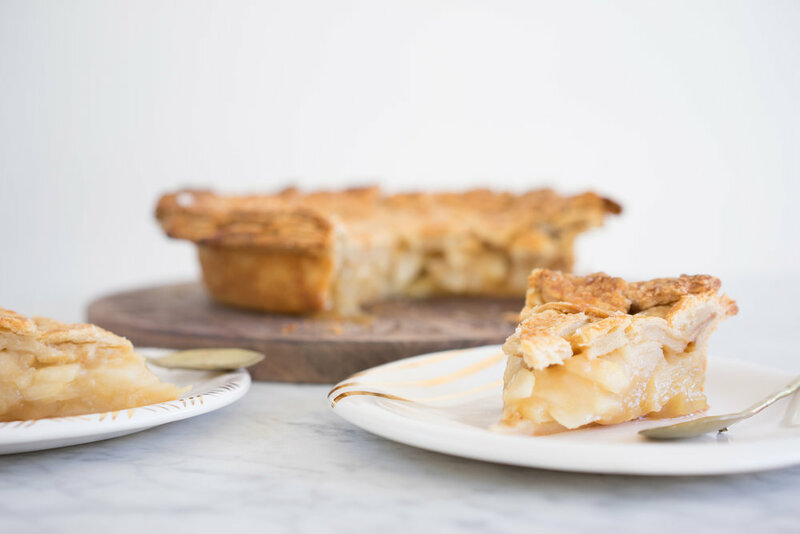 This is a recipe for a simple pear pie with a chai salted caramel. I had a coffee a few weeks ago with the lovely Amy who has a company called Dona Chai (Turns out we live on the same street!) And she gave me a bottle of her concentrate. I had been meaning to make a chai caramel pie for a while, so it was great timing! After several caramel experiments I found a method that was a balance between a good caramel consistency and a nice chai flavour (the first one was solid enough to make truffles with), through deglazing the sugar with the concentrate mixed with a little cream. If you don't have chai concentrate you can most definitely infuse the cream (replace the concentrate with cream, so use half a cup) with either loose chai or a few chai tea bags - just bring the milk to just below a simmer, add the chai, and steep for 20 minutes before straining well. Feel free to sub your favourite all-butter crust in here. (I am a die hard Four and Twenty Blackbirds fan) I topped mine with a lattice and then some shapes stamped out with pastry stampers, but you can really go wild here, or keep it simple with a plain pastry top. It is important to make sure that the pears are packed very tightly in the bottom of the pie to ensure that the caramel does not make the bottom soggy - I managed to seal mine off nicely and it popped right out of the dish all in one piece, which was sort of like Christmas! Combine ice, water and cider vinegar in a bowl. Sprinkle a few tablespoons of the ice water into the flour and butter mixture, and using a stiff spatula or your hands, mix in well. Continue adding water a tablespoon at a time ( I normally need about 12 tbsp) until you have a dough that holds together well, but is not too wet. Squeeze together with your fingertips to make a homogenous dough. Shape into two rectangles and wrap in plastic wrap. Rest in the fridge for at least two hours, or preferably overnight. On a lightly floured surface, roll one rectangle of dough into a circle slightly larger than your pie dish. You want it to be approximately 1/8 inch (3mm) in thickness. Line the pie dish, leaving the extra dough overhanging. 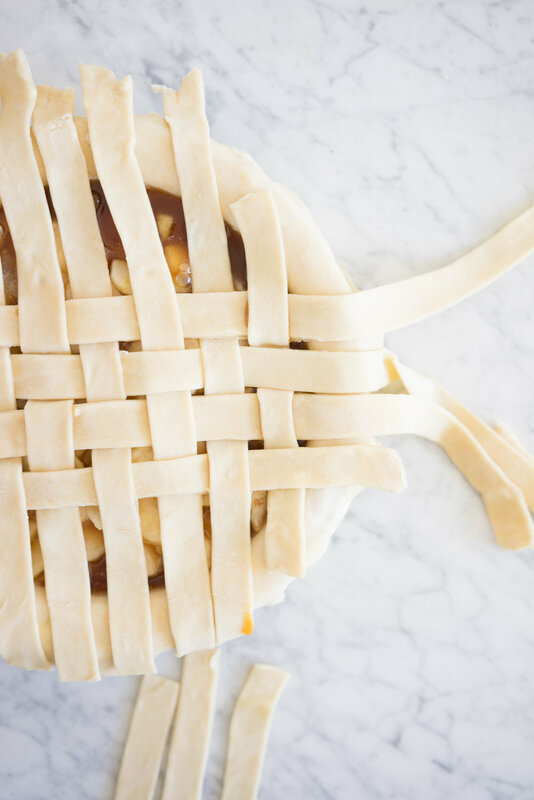 Roll out the second rectangle of dough, and cut enough strips to form a lattice for the top. Place on a lined baking tray. If desired, use pastry stamps to cut out shapes from excess pastry. Refrigerate both the lined dish and the lattice and shapes until ready to fill. Place sugar in a medium sauce pan. Measure Chai concentrate and cream into a second saucepan, and heat over very low heat until it is just below a simmer. Over medium to high heat, heat the sugar until melted, stirring occasionally. Cook until it reaches an amber colour, or 175c/350f on a sugar thermometer. Remove from the heat and carefully whisk in the cream and chai mixture - be careful as it may bubble. Whisk well until incorporated, then add the butter a chunk at a time, whisking well between each addition until all incorporated. Leave to cool while you prepare the pie filling. Juice the lemons and place the juice into a large mixing bowl. Peel, core and slice the pears into thin slices. Dip them in the lemon juice and place into another mixing bowl. Sprinkle with 2 Tbsp sugar. Leave for 20 to 30 minutes to release some juice. Transfer pear slices to another bowl, discarding the juice. Sprinkle with the flour and remaining sugar. Toss until well incorporated. Preheat the oven to 400f/200c, placing a baking sheet on the bottom rack of the oven. Remove prepared crust and lattice strips from the fridge. Layer the pear tightly in the pie crust, mounding slightly in the middle. Pour the cooled caramel evenly over the top of the pie, reserving about a 1/4 cup. 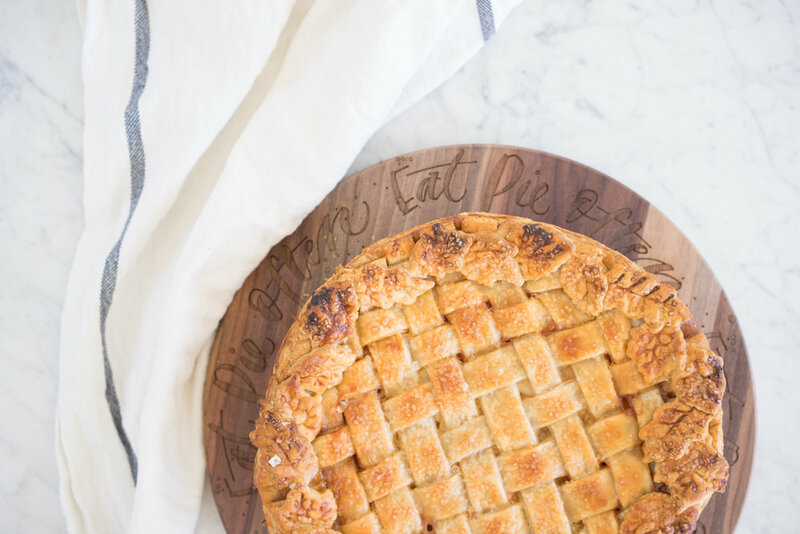 Arrange the strips in a lattice on top of the pie, decorating as desired. Trim dough to within 1 inch from the side of the dish, fold over and crimp. 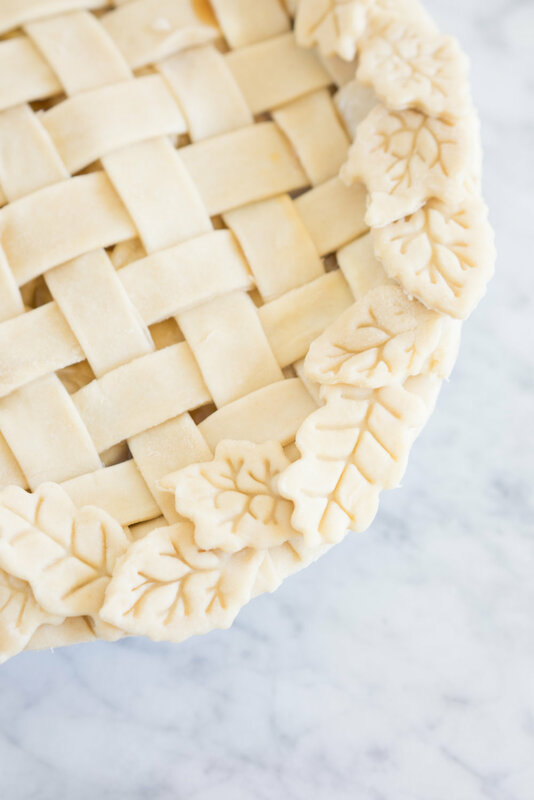 Alternatively, trim edges close to the side of the dish, and arrange stamped shapes around the outside perimeter of the pie, using a little water or milk to help stick them down if necessary. Chill the pie in the oven for 15-20 minutes to set the crust. Whisk the egg, water and salt together and carefully brush over the pastry, being careful not to drag any caramel onto the pastry as it will burn. Sprinkle liberally with demerara sugar and finish with a small sprinkle of flaky sea salt. Place on the baking sheet in the oven. Bake for 20 minutes until beginning to brown. Reduce the oven temperature to 375f/190c, and move the tray to the middle oven rack. Bake until deeply golden and the filling is bubbling, approximately 30 to 35 minutes. Remove from oven and allow to cool completely. Serve with ice cream and remaining caramel sauce.